2 Bedroom, 1 Bathroom, Sleeps 5 - 6, with Swimming Hole. Summer in the Catskill Mountains is in full swing within nature and festivities. Trails that make your heart soar are awaiting your presence. At Streamside one can cook & then dine privately with your own romantic meal in a classic diner booth, while enjoying mountain picture views. Unwind and rejuvenate in this unique artist-designed, sun-illuminated, streamside apartment that embodies the Catskill Mountains both inside and out. Under a star-studded sky away from city glare enjoy the fireflies dancing through the night. If a night is cool, relax in front of a cozy fire. Surrounded by mountains and sky, and rushing streams, this is an ideal haven to recharge and reboot, dream, & be inspired. Summer Swim in the refreshing waters of the "on-property" swimming hole and relax with the naturally bubbling Jacuzzi as the stream fills the swimming hole. After swimming one can walk along the stream wilderness or observe the aquatic bird life. 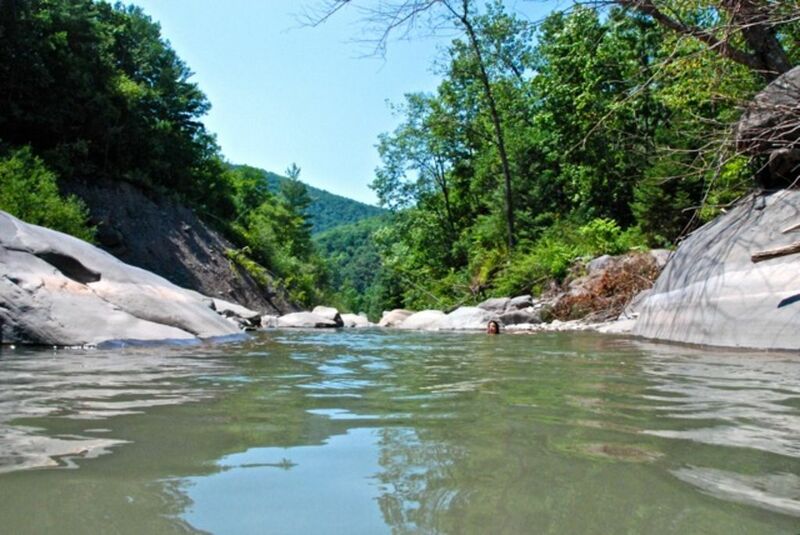 Streamside is perfect restorative space for hikers, and festival enthusiasts: all those seeking to refresh themselves, after adrenaline fueled mountain challenge, zipline, rock climbing, or simply after enjoying the raw beauty of the Catskills or local culture. Chichester Yoga, a minute walk from Streamside offers a variety of yoga classes. In Phoenicia, Kathryn Haber Massage Therapist and Julia Rose Acupuncturist are both practicing local healing legends. One can schedule appointments ahead of time. Also on the side of Mt Tremper is the Zen Mountain Monastery with their Sunday morning Program open to the public. There are also shops of fabulous diversity: Home - well sourced treasures of contemporary items, Mystery Spot - realm of cultural archival-ness reactivated, 60 Main - hand painted clothes and hip-ness, Nest Egg - local fudges and gifts, Morne Imports - serves the outdoor sports enthusiast and Port Authority Trailways bus. Art Upstairs has regular openings that are Saturday night events filled with local art lovers. The Phoenicia Jazz Series hosts Thursday night concerts from high caliber musicians. Phirst Phriday is another music night in the gallery each month. Gain the skills of Rappelling as taught in Phoenicia at the Sundance Rappel Tower. Woodstock and Hunter are both nearby, where you can explore, shop, dine, and play. Kitchen counter and classic diner booth dining. Living room offers plenty of choice of couch spots to relax in. Watch the hummingbird frenzy at the window feeder. Newly renovated two bedroom apartment with full size couch/bed for additional guests. Local photographs/trail maps and owner’s Pacific heritage, adorn the walls. Washer/Dryer is here for longer staying guests if needed. 5 minutes by car to Phoenicia restaurants, galleries, and shops. Backyard access to the Stony Clove Stream & Swimming Hole. No smoking - (A smoke free property). No Pets. Not suitable for hosting events, entertaining non guests or wedding parties. Hunter/Belleayre Skiing / Music Festivals, 10 minutes. Easy access to hundreds of acres of state land for hiking and foraging. Open swimming 29-acre lake, 20 minutes. Mount Tremper Farm stand, 10 minutes by car - Recommended for food shopping 3 seasons each year. Tub/Shower with Spa shower-head. New toilet and custom Vanity. Mirrors are plentiful.